The New Orleans scent is bright, mossy, and delightful. 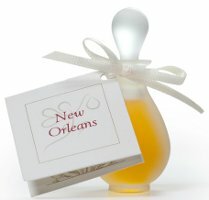 The perfume plays off of New Orleans’ landscape, capturing salty notes from the lake with seaweed and ambergris, the woodsy smell of the trees with cedarmoss, vetiver, and amyris, as well as a Southern Belle’s favorite floral tones like magnolia and tea olive. Additional notes include rose, lemon, mandarin, cypress, rosemary, seaweed and grapefruit. I’ve been wanting to try this line, as I have heard a lot of good things about it, but have been a little hesitant because I have had trouble with natural perfumes having no longevity at all on my skin. These are not cheap, and while I understand why natural perfumes are costly, it is not worth it to me if the perfume will disappear from my skin in 30 minutes. Could anyone here offer some guidance as to what I can expect? I got the Anya’s Garden sample set, and none of them lasted even an hour. The SSS perfumes, on the other hand, tend to last a good while on me–at least 3 to 4 hours, sometimes longer. I wonder if this is the difference between 100% natural perfume and “mostly natural with a small amount of synthetics”? If there is someone else out there with perfume-eating skin who has tried the Ayala Moriel line, I would like to know what your experience was. There is no doubt that on average, synthetics last longer, but I think it isn’t so much that some natural brands make perfumes that last longer as that some particular natural materials last longer on skin than others. In other words, it’s very hard to tell without trying something. For any given brand (Aftelier, Anya’s Garden, Honore des Pres) I’ve found some of the fragrances do better than others. Which is really no help, sorry. I have tried them, I have perfume eating skin as well, and all I can say is Beware! They last about ten minutes, and they are all more like aromatherapy oils than perfume. Waaayyyy overpriced if you ask me, if you want to try an all-natural perfume that lasts 3-4 hours check out Strange Invisible Perfumes, I believe samples there are $4. I have perfume-eating skin too. I have never tried this line. But I do find that if I apply an un-scented moisturizer right out of the shower and then re-moisturize the spots you want to apply your perfume to, the scent will last longer than it used to on me. Wait to apply the 2nd coat of moisturizer until immediately before you apply the perfume. Instead of 1 hour, I may get 2-3 hours. When I saw the bottle, before reading the name, I thought it was a J’Adore flanker. . .very similar, but I do think the frosted glass is pretty. Yes, and the heavier the lotion, the better. Oh wow, this sounds amazing! But sadly, out of my price range. I like the sound of this one, too. Perhaps it’s time for me to sample some more from this like. I thought about you immediately with “salty”. Sounds good but IMHO the bottle doesn’t really say unisex. I think she uses the same bottle for all her perfumes.